As you have probably noticed, I am a breastfeeding mom. My children both nursed until they were 12 months and from that point on, they weaned themselves. I suppose I could have pushed the issue with them and gone further, but it really didn't seem practical at that point. They weren't nursing for nutrition's sake, but purely for comfort. It was very evident that it was time to quit. At least it was a mutual agreement. :) During the 12 months of breastfeeding my children, I was not ashamed to nurse them in public places. I would nurse in stores, restaurants, airplanes, in front of relatives, etc. It wasn't a big deal to me and the reason for that was because I was always covered. My daughter liked to "flash" people every now and then but the more experienced I became at breastfeeding, the easier it is was to distract people from seeing anything. To me, nursing is an invaluable experience-both for mom and for baby. It is a time of bonding and closeness that rarely comes in any other way. In order to have a successful public nursing experience, I believe that a functional nursing cover is a MUST. Today, I have a company to introduce to you that I love and that I am so thrilled to have participate in my Baby Shower Gift Guide Event! Bebe au Lait is a company that makes nursing covers and burp cloths. All of their patterns and products are very fashionable and stylish, I can't think of any mom who would not LOVE to receive one of their nursing covers as a gift! Established in 2004 and initially known as "Hooter Hiders," Los Gatos, California-based Bebe au Lait develops superior quality products that pair beautiful prints with luxurious fabrics to meet the needs of modern, active parents. Bebe au Lait's first and best known product, its award-winning nursing cover, was born out of necessity when co-owner Claire Ekelund found nursing her infant daughter in public challenging. And so, the Hooter Hider was born: an easy-to-use, multi-purpose, machine washable, stylish nursing cover designed with baby and mom in mind. The nursing cover's unique design with its Rigiflex™ neckline promotes bonding between mother and nursing baby and has been the recipient of multiple patents. The Hooter Hider garnered immediate attention from stylish moms and celebrities across the nation and in media such as US Weekly, People, Fit Pregnancy and VanityFair.com. Since then, Bebe au Lait has grown into 3 brands: Hooter Hiders, Bebe au Lait, and most recently, Lille. Providing a variety of products to meet the needs of style-conscious, modern families, these products include burp cloths, hooded towels, luxury blankets, and nursing cover gift sets. Bebe au Lait now distributes its products internationally in more than 60 countries. In the U.S., its products are available through its website at bebeaulait.com, specialty retailers, and national retail chains such as Babies R Us and Nordstrom. I actually first heard of Hooter Hiders as a friend of mine was using one of their covers when we were out one day. It looked so comfortable and I really envied her...I wanted one too! That was several years ago now and I cannot remember where I ended up getting my very first nursing cover. So, for this review I was sent a Bebe au Lait Nursing Cover in the print of my choice and I chose the Kensington print. I love turquoise, green and blue so this seemed like the most elegant and appropriate choice for me. This nursing cover is not bulky or heavy at all and folds up very compactly for discreet carrying. When I first saw it, I was REALLY happy because it has a rigid, yet flexible neckline that allows me to keep an eye on the baby while nursing. This has been something that I have not always had the luxury of having. One of my favorite features of the cover is the fact that it has two terry cloth pockets sewn into each corner of the inside of the cover. This makes it easy to store baby's pacifier or a nursing pad while breastfeeding. I love the idea of having storage built right into the cover! Awesome! When I tried on this nursing cover I loved how light and airy it felt. You cannot see through it and it really covers well. The colors are gorgeous and while it looks like a nursing cover, you definitely feel stylish while wearing it! The ties around the neck are adjustable as well so you can wear it higher or lower, depending on how tall you are. 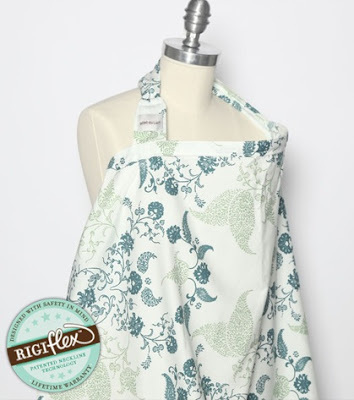 Each nursing cover from the Bebe au Lait retails from $35 - $38 dollars depending on the print you want. It is VERY hard to pick one out by the way as there are soo many from which to choose! So, in my opinion...Bebe au Lait makes one awesome nursing cover! As a mom who advocates public breastfeeding, I am totally sold on their covers. They are modest, practical and very easy to use. Forget being embarrassed to nurse in public...do it in style! I also love how you can use this cover as a changing pad, stroller sun shade and light blanket. Products that allow me to multi-task are my best friend! Disclaimer: I received no monetary compensation for this post.I did receive a free Bebe au Lait Nursing Cover for review purposes. All quotes and stock photos are from the Bebe au Lait website and email. Prize is being provided and shipped by the sponsor. All thoughts and opinions are 100% mine. I like the Hot Dots cover! I like the Poppy Hills. I like the papillon style. I love the black eyelet! I would choose the Chateau Silver print. The Chateau Silver is smashing! I like the Hot Dots print. It was really hard to choose but I really like the Parfait. I'd pick the Poppy Hills and Sevilla! I would love the Ascot print. My favorite print is the Royale!! Love the rich color. I love all these prints! If I had to choose I'd pick the Hot Dots cover. I love the barcelona print!! I would choose Chateau Silver. hot dots cover is nice. I like the Sevilla print. I like the Yoko print.